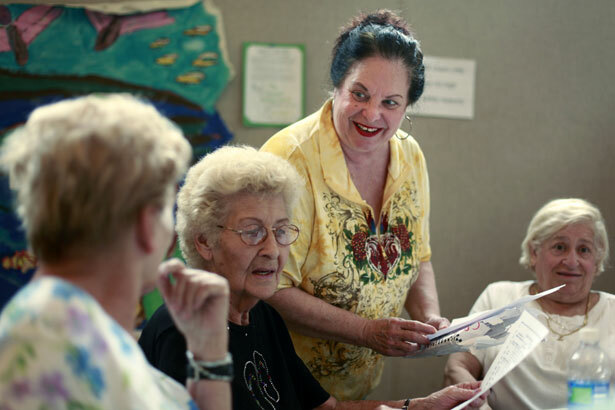 Older Americans Act programs save money and lives. Why is it so hard to reauthorize something that consumes just 0.06 percent of the budget? Honoring our grandparents, our elders—in these divisive times, at least we hold this value in common, right? As children, we dutifully sat through long visits or lectures from older relatives, teachers, neighbors or family friends; and then wised up to learn that some of these relationships would prove to be our most enduring. It’s enough to make you think that maybe—just maybe—this shared experience would lead to a steadfast commitment from policymakers to ensure that those who cared for us, fought for us, and raised us, are able to meet their basic needs. But if you attended Senator Bernie Sanders’s hearing on reducing senior poverty and hunger through the Older Americans Act (OAA) on Wednesday, you were in for a rude awakening. Signed into law by President Lyndon Johnson in 1965 at the same time as Medicare and Medicaid, the OAA provides federal funding for essential senior services like job training, caregiver support, transportation, preventative healthcare, meals and protection from abuse and financial exploitation. Funding for the legislation has failed to keep pace with inflation and population growth for decades. Under sequestration, an additional $40 million will be cut from senior meal programs alone, which means that as many as 19 million fewer meals will be available to seniors who need them. It emerged as the central theme of the hearing—that shortchanging OAA programs isn’t simply a failure on moral grounds, it’s bad economic policy. Ellie Hollander is president and CEO of the Meals On Wheels Association of America, a nonprofit organization representing local senior nutrition programs in all fifty states. She noted a recent study by the Center for Effective Government, which found that for every $1 in federal spending on Meals on Wheels, there is as much as a $50 return in Medicaid savings alone. But these meals—delivered directly to an individual’s home or to groups at places such as senior centers—currently reach only 2.5 million of the 8.3 million elderly who struggle with hunger. “The resources fall substantially short,” said Hollander, noting that demand is increasing and that the senior population will double to more than 70 million people by 2030. She said that real funding levels (adjusted for inflation) for OAA nutrition programs have decreased 18 percent since 1992, while the population of those age 60 and older has increased 34 percent over that same period. Howard Bedlin, vice president of public policy at the National Council of Aging—a nonprofit service and advocacy organization focusing on economically disadvantaged seniors—testified that there are now more than 23 million economically insecure Americans over 60. They struggle with rising energy and healthcare bills, diminished savings and job loss. The recession caused median wealth for people between ages 55 and 74 to decline by approximately 15 percent, and for those over 65—many of whom now need to continue working or go back to work just to stay afloat—unemployment is at its highest rate since the Great Depression. The OAA’s Senior Community Service Employment Program is “the nation’s only workforce program designed exclusively [for] vulnerable seniors,” said Bedlin. Nearly 90 percent of participants live in poverty (on less than $11,000 annually), and one-third of them are homeless or at risk of homelessness. While these seniors receive job training that in some cases prevents homelessness, they also perform millions of hours of community service for local organizations struggling with their own budget cuts—“with a value to states and communities estimated at over $1 billion.” Due to a lack of resources, the number of seniors served by the program has declined by 34 percent since FY 2010, and the program now has waiting lists in many cities. Bedlin also addressed the fact that nursing home costs are now $84,000 annually so “it doesn’t take long to essentially go bankrupt” due to long-term care. But the OAA’s Home and Community-Based Supportive Services help people avoid this situation and remain in their homes, by providing for needs such as transportation, case management, adult daycare and chore assistance. Bedlin also singled out OAA’s cost-saving role in funding evidence-based “fall prevention programs.” One in three seniors falls every year, and falls are the leading cause of fatal and nonfatal injuries for people ages 65 and older. The resulting injuries are projected to cost the nation $60 billion in 2020. Research has shown that several local, OAA-supported programs have reduced falls by 30 to 55 percent—which saves money and lives. Senator Elizabeth Warren pointed to the Pension Counseling and Information Program—which helps seniors recover lost pensions—as one that could be reaching many more seniors with a modest investment. As companies merge, move or change names, people are sometimes unable to obtain the benefits that they worked for, and can’t afford legal assistance to help them recover what they’ve earned. This OAA program funds six regional counseling projects that help individuals in 29 states. Nancy Altman, co-director of Social Security Works, testified that the counseling program has recovered more than $175 million in pension benefits for 50,000 clients since 1993—a return of $8 dollars for every federal dollar spent on the program. The current federal cost is $1.6 million, and those monies are used to leverage private and foundation resources, as they are with all OAA programs. Altman said that some of the states not covered by the six regional projects have a high senior population, such as Florida. If all fifty states were served, Altman believes pension benefits recovered for seniors would likely double. For Warren, the need to support OAA programs is clear. Fifty years after the March on Washington for Jobs and Freedom, most of its goals have not been accomplished. In The Unfinished March: An Overview, Algernon Austin, director of EPI’s Program on Race, Ethnicity and the Economy, explains that while the March on Washington for Jobs and Freedom led to legislative victories, the hard economic tasks of the march remain a distant dream. The remaining goals of the march include the demand for decent housing, adequate and integrated education, full employment and a national minimum wage that can lift a family out of poverty. These goals are all crucial to transforming the life opportunities of African-Americans and people of all races and ethnicities. Visit The Unfinished March and sign up for updates. Your piece on the adequacy of the food stamp program raised an important point that is largely missing from the debate. Unfortunately the question of adequacy is largely absent from most discussions of anti-poverty programs. There seems little interest in adequacy in large part because many people think that a sizable portion of the budget is devoted to these programs. Certainly this is the case with food stamps where Republicans have sought to make a huge issue out of program that accounts for a bit more than 1.7 percent of the budget. The media deserve much of the blame for this since they routinely report on programs in dollar amounts that are essentially meaningless to the vast majority of their readers. For example, telling people that the food stamp program costs $76 billion in 2013 conveys almost no information. It would mean the same thing to the vast majority of their readers if they said $7.6 billion or $760 billion as the NYT mistakenly did in a recent article. It would be the easiest thing in the world for reporters to express items as a share of the budget in addition to or in place of the dollar amount. And, it is the sort of thing that progressives could reasonably push the media on. I have discussed this with several budget reporters and not one has ever tried to argue with me that the “$17 billion” expenditure on TANF means anything to the vast majority of their readers. It’s just a ritual—that is how you report the budget. If anyone other than me ever harassed the media on this we could get them to change and it would matter—it would be a bit hard for John McCain to run around the country complaining about the Woodstock Museum that cost 0.00003 percent of the budget. In other words, if people were better informed about the budget, we would have a much more serious debate about poor people’s program. Advocate’s Training: Demystifying the Federal Budget, Sequestration & their Impact on Virginia (Tuesday, June 25, 3:30 pm–5 pm, University of Richmond Downtown Campus, 626 E. Broad Street, Richmond, VA.) Hosted by the Virginia Interfaith Center, the Coalition on Human Needs and the Half in Ten Campaign, this educational program is designed for professionals whose work may be impacted by sequestration in Virginia. Register here. Community Forum: The Federal Budget, Sequestration, and their Impact on Virginia (Tuesday, June 25, 6 pm–7:30 pm, University of Richmond Downtown Campus, 626 E. Broad Street, Richmond, VA.) Join the Virginia Interfaith Center, the Coalition on Human Needs and the Half in Ten Campaign for this interactive and educational program. A light dinner will be served. Register here. “Chicago to Shutter 50 Public Schools: Is Historic Mass Closure an Experiment in Privatization?” Democracy Now! “Keeping Up with the Times: Supporting Family Caregivers with Workplace Leave Policies,” AARP Public Policy Institute. The only piece of federal legislation that addresses the need to take time off work to care for family is the 1993 Family and Medical Leave Act, which remains woefully inadequate because it only guarantees up to twelve weeks of job-protected leave to care for one’s own health needs or that of a family member. Not all workers are covered by the Act, and it only guarantees unpaid leave—and might not cover care for someone other than a parent, spouse or child (such as a grandparent). This report focuses on workers with responsibilities to seniors and highlights public policy solutions to extend protections for working caregivers and better support them. “Who Would be Affected By a New Minimum Wage Policy?” Carsey Institute. Two legislative proposals before Congress propose to raise the minimum wage to $10.10 per hour. This brief explores the characteristics of the earners who would be affected by a new minimum wage policy by comparing them with the hourly workforce in the status quo and examining the differences between rural and urban workers in particular. Two key findings are that proposed minimum wage increases would disproportionately affect less-educated workers and women. “Making Medicaid Work for Children in Child Welfare: Examples from the Field,” Center for Health Care Strategies. This report explores the strategies used in four states to enhance the effectiveness of their Medicaid programs and improve responsive care for children and families, outlining best practices in multiple areas to inform other states efforts to better serve children with physical, dental and behavioral health needs. “A Broken Bargain: Discrimination, Fewer Benefits and More Taxes for LGBT Workers,” Movement Advancement Project, Center for American Progress, Human Rights Campaign. This report looks at the ways in which legal discrimination imposes challenges upon the approximately 5.4 million LGBT workers in the US workforce. No federal law provides explicit nondiscrimination protections for LGBT workers, and workers can also be denied equal access to benefits and family tax relief. Such discrimination without legal protection makes it harder to find and retain a job, so workers and their families find themselves vulnerable and at risk. LGBT people are at higher risk of poverty than non-LGBT people, and married or partnered LGBT individuals raising children are twice as likely to have household incomes near the poverty line compared to married or partnered non-LGBT parents. The study offers a number of recommendations for action by all levels of government, as well as for employers, including reducing barriers to finding jobs and providing equal access to benefits. “The Intersection of Welfare and Disability,” MDRC. The Temporary Assistance for Needy Families (TANF) and Supplementary Security Income (SSI) programs pose challenges to coordination even though both have the goal of serving low-income individuals and families. The hope is that the TANF/SSSI Disability Transition Project will find ways to best serve low-income families in which one parent (or both) has a disability. This report describes how the two programs interact, based on field assessments from four states. One key finding is that the population served by both programs is not large—less than 10 percent of TANF recipients had an open SSI application, and just 6 percent of adults applying for SSI received TANF benefits within a year of their application. “It shouldn’t be a heavy lift: fair treatment for pregnant workers,” National Women’s Law Center. This study finds that women still face discrimination at work when they become pregnant—for example, when they ask for temporary modifications of job duties (avoiding heavy lifting, being permitted to sit down, etc). Such job adjustments would be allowed for those with a disability, but since pregnancy is not a disability, pregnant workers’ requests are often denied and they are at risk of being fired or pushed onto unpaid leave. Since many of the women who need workplace accommodations are low-wage workers, women of color and immigrants are disproportionately represented. The report calls for laws and enforcement efforts to mitigate abuses of the Pregnancy Discrimination Act. Families receiving cash assistance, 1996 (pre-welfare reform): 68 for every 100 families living in poverty. What are Congress and the media missing in the food stamp debate?